Duck a l’Orange lives in our memory as one of our first introductions to restaurant food. In Montreal, where we lived, it was fairly ubiquitous on the city’s better menus. We loved it for its sweetness and its crunch. For the dark duck meat and the crispy skin. For the orange sauce with its taste of Grand Marnier. We remember feeling sophisticated just ordering it…although we likely didn’t know what the word sophisticated meant at the time. At any rate, when this month’s Food and Wine arrived, an article written by Rux Martin, the editor of the soon-to-be-published “Essential Pepin” Jacques Pepin’s soon-to-be-released cooking anthology, intrigued us. 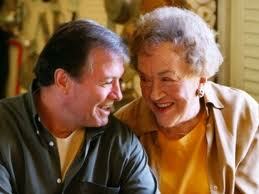 Jacques Pepin probably taught more Americans about French food than anyone other than Julia Child. And for her ultimate Television Program, Ms. Child had the good sense to enlist M. Pepin. “Julia and Jacques: Cooking at Home” had the two great chefs dueling over some recipes, making things two ways to prove their points but most of all, collaborating in bringing French cuisine within easy reach of a somewhat above average home cook. That was quite a feat in and of itself. How I remember my father, the gourmet and Gourmet reader rolled into one, reading the following from the venerable two volume Gourmet Cookbook published in 1950: “First, wring the duck’s neck until it is dead”. Phrases like this likely did more to encourage vegetarianism than PETA has. Duck a l’Orange was not a home cooked item, at least not at our house. But when Rux Martin extolled the recipe as ‘the single best dish I’ve had all year”, we really could not wait to make it. Despite a daunting list of ingredients and a rather lengthy cooking time, following M. Pepin’s recipe was not all that difficult. And the results were every bit as delicious as his editor’s praise implied. When you exit the subway at Grand Street in lower Manhattan, you enter another world. Or at the very least, another continent. You have left New York and you are now squarely in Asia. The streets teem with people. The sidewalks overflow with vegetables and fruits of every description, most of which you will not find in any store ten blocks north or east or south. You are in the middle of Chinatown, one of New York City’s great places to food shop. We couldn’t think of a better place to find the main ingredient for our French-accented dinner than Chinatown. There’s one market in Chinatown that runs from one block to the other. There’s an entire prepared food area which leads into the butcher’s shop. Here in cases packed with poultry, we found a perfect duck. Perhaps a little too perfect –because ours came with its head, neck and feet very much attached. 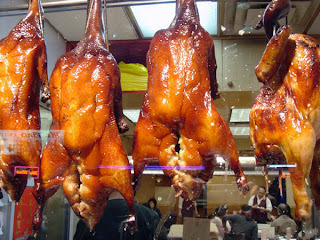 Everywhere you look in Chinatown, you see cooked ducks hanging in the windows with all their limbs attached. We were just a little unsure of how our duck would be greeted at home in such condition. Fortunately, the shop is filled with butchers fulfilling orders. It may be entirely possible to go through life in Chinatown without speaking a word of English. We were one of very few Western customers in the store. Hand signals were needed to explain our wish for a headless, footless, neckless duck. ( Sadly, we later found out that we should have kept the neck as it is used to boost the flavor of the delicious orange sauce. ) But we were so pleased with our purchase, we headed home having had a truly fascinating shopping trip. 1. Preheat the oven to 450°. Cut off the first two wing joints of the ducks and reserve. Chop the necks into 2-inch lengths. 2. Prick the ducks around the thighs, backs and breasts. Season the ducks inside and out with salt and pepper. Set a rack in a very large roasting pan. Set the ducks breast up on the rack as far apart as possible. Add the water to the pan and roast the ducks in the center of the oven for 20 minutes. Turn the oven temperature down to 350°. Turn the ducks on their sides, propping them up by placing 2 large balls of foil between them, and roast for 30 minutes. Turn the ducks to their other sides and roast for 30 minutes longer. 3. Meanwhile, in a large saucepan, heat the oil. Add the hearts, gizzards, wing joints and necks and season with salt and pepper. Cook over moderately high heat, stirring, until richly browned, 10 minutes. Add the carrots, tomatoes, celery, leek, onion, garlic, bay leaves and thyme and cook, stirring, until softened, 5 minutes. Stir in the flour and tomato paste, then gradually stir in the stock and wine. Bring to a boil, stirring, then reduce the heat to moderately low and simmer for 1 hour. Strain the sauce into a bowl, pressing on the solids. 4. Meanwhile, remove the zest in strips from 1 of the oranges. Cut the zest into a very fine julienne. In a small saucepan of boiling water, blanch the julienne for 1 minute. Drain and rinse under cold water; pat dry. 5. Halve and squeeze 2 of the oranges; you will need 1 cup of juice. Peel the remaining oranges (including the one you stripped the zest from) with a knife, removing all of the bitter white pith. Cut in between the membranes to release the sections into a bowl. 6. In a medium saucepan, boil the sugar and vinegar over moderately high heat until the syrup is a pale caramel color, 4 minutes. Gradually add the 1 cup of orange juice, then the currant jelly and bring to a boil. Add the strained duck sauce and simmer over moderate heat to reduce slightly, 8 minutes. Season with salt and pepper. Add the Grand Marnier and remove from the heat. Swirl in the butter, 1 tablespoon at a time. 7. Pour off the fat in the roasting pan. Turn the ducks, breasts sides up, and roast for 40 minutes longer. Remove the ducks from the oven and preheat the broiler. Broil the ducks 6 inches from the heat, rotating the pan a few times, until richly browned, about 3 minutes. 8. Insert a wooden spoon into the cavities and tilt the ducks, letting the juices run into the pan. Transfer the ducks to a platter and keep warm. Scrape the pan juices into a fat separator and pour the juices back into the roasting pan. Simmer over moderate heat, scraping up any browned bits and coagulated juices. Strain the contents of the roasting pan into the orange sauce. 9. Garnish the duck platter with the reserved orange sections and scatter the blanched zest over the ducks. Carve the ducks at the table and pass the sauce separately. MAKE AHEADThe base for the orange duck sauce (Step 3) can be prepared up to 2 days ahead and refrigerated. I know this may seem a bit off base considering most people in their college years survive on day old bagels or Ramen noodles but I had the luxury of cohabitating with a great chef during my college days. One of her specialties was Duck L ’Orange, or so it seemed. I think we probably had this dish at least once a month and it was glorious. Needless to say, I still recreate her recipe from time-to-time; I won’t tell you how many years, I mean decades, have passed and I still love it. These days I get to pair it with something better than Canai wine. Considering this dish leans towards the sweet end of the flavor spectrum I suggest pairing it with a great Reisling or Gewurztraminer from Alsace or the Rheingau. Either way, it will be delicious. Bon Apetit!